Aquatic Environmental Services, Inc (Ball Ground, GA) and The Mapping Network recently completed a mapping project for a home owners association in Georgia. The lake has a history of significant sediment problems. Aquatic Environmental Services, Inc mapped the lake in 2007 and the lake had been dredged shortly thereafter. Now, four years after dredging the lake, homeowners are having difficulties navigating through the coves. Aquatic Environmental Services, Inc., updated the lake map a week ago to note current water depths and mark sediment depths. Another component of the project was to calculate the amount of material needed to be removed in order to make the coves 4 foot deep. 3D models were generated to show how much sediment had accumulated in each cove. Contour maps were also made for each cove and given to the lake manager and engineer to review for dredging planning. The Mapping Network then created cut-fill calculations and maps based on the specifications of the lake manager. The HOA will then use this information as part of the bid package given to dredging companies. Presenting the precise plans took out the guess work and keep all the dredging contractors on task. 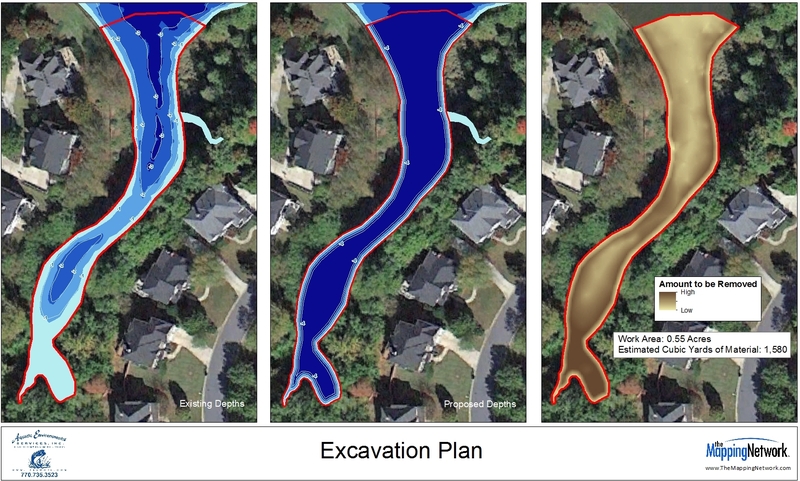 Information gathered during the lake mapping process helped Mr. Grimes’ client better comprehend the level of sedimentation building up over time in the lake. The resulting map provided the baseline depth profile needed for long-term sedimentation monitoring. Here at The Mapping Network, we specialize in accurately mapping bodies of water, calculating the water volume, collecting sediment depth samples at critical areas and monitoring the distribution of sediment over time. We have a nationwide group of professionals specializing in all facets of lake management. The bottom line – This powerful information allows for smart management and planning decisions and will serve as a baseline for future projects. A great value! In the maps above, the HOA needed the depths of the cove to be a minimum of 4 foot for boat access. Mapping Network located the areas where the current depth was less than four feet, which was the dredging zone. The Mapping Network calculated the dredging area and volume. The current lake bathymetry (left) and the post-dredge contours (middle)are shown in blue shading. A cut-fill model (right) shows areas of cut needed to reach the goal. This entry was posted in Lake Map, Sediment and tagged aerial lake map, Aerial Map, Bathymetric Map, Bathymetry, Dredging, Fishing, GIS, GPS, GPS Lake, GPS Map, Habitat, Hunting Land, Hunting Property, lake, Lake Management, Lake Map, Lake Mapping, Lake Survey, Land For Sale, Land Mapping, Sediment, Sedimentation, Survey, texas fishing, Texas Lake Map, Texas Map, The Mapping Network, Waterfowl on February 3, 2012 by Moderator.